Wind direction is reported by the direction from which it originates. For example, a northerly wind blows from the north to the south. 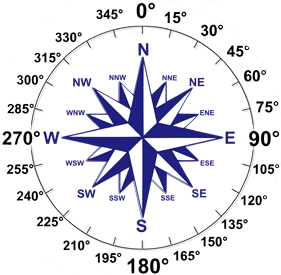 Wind direction is usually reported in cardinal directions or in azimuth degrees. For example, a wind coming from the south is given as 180 degrees; one from the east is 90 degrees. Wind Speed is based on a 10-minute average.